Let’s take a look at what’s going on here. The idea behind this design is not for spying, it is actually designed to be more aerodynamic. Ahhh, that makes sense. You see, with the new huge modern clubheads of today, the designer's were stumped at how to make the ball go further. The darn USGA put a restriction to how big they could go – and even if they didn’t – it’s getting pretty ridiculous. How fast can you swing a toaster oven on the end of a stick anyway? The only choice to help you increase your clubhead speed is to cut down on the drag or wind resistance. SHAZAAM! I give you the aerodynamic TaylorMade Droid…Errrr I mean Burner. Although aerodynamics are cool, this is not the main reason I like the club. My two favorite things about this driver (especially for the lady golfers) are the huge forgiving clubface and the extremely light weight of the driver. The clubface is the largest face of any of TaylorMade's drivers. As I mentioned earlier, the club makers were bound by the USGA standard (which they maxed out here.) Now you can have the confidence to grip it and rip it like the boys. (Sorry, did that sound sexist.) You know what I’m saying, and the club is so big you can’t possibly miss the ball. Even if you do, you don’t have to suffer the humiliation of not getting it past the lady’s tee. What's more is, because of the fighter wing shape, the MOI is huge. What the heck is MOI? That stands for Moment of Inertia. This is a fancy way of saying, “you couldn’t twist this club if you had a vise grip. You see all the weight is in the rear of the clubhead and thus even if you catch the ball out on the toe, the club will hold steady and the ball will fly far. Furthermore it means you get the most out of the entire ginormous clubface. If you can manage to make contact with the golf ball (and I'm not sure how you can miss it with this monster), then the ball will fly high and far even on hits that aren't perfectly on the middle of the clubface. This is a great driver for all levels. It’s geared more for higher handicappers that have distance as their main goal. Those golfers who are not trying to work the ball and want all the forgiveness a driver can offer. This spy plane has that and cuts through the air to boot. 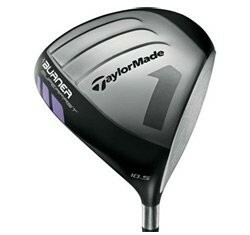 However, before you purchase, I'd encourage you to look at the TaylorMade Lady R9 Supertri Driver (460cc). I like this driver because of the adjustable clubhead.